Microscope with mechanical stage, preferably bifocal with 15 X wide field or hyperplane oculars and 16 mm objective. Microscope lamp. A yellow filter (Wratton G #15) is sometimes helpful. WBC pipettes and rubber aspirators (R BC pipettes may also be used for dilutions of 1:100 or more). Eosinophil counting chamber and cover glass. Drawing Blood (drop puncture method): Clean, dry and then puncture the skin (usually on ear or finger) so that blood will flow freely. With a soft tissue, wipe away first two drops. As the blood oozes from the wound, draw it into the pipette until slightly past the 0.5 graduation. The pipette is then quickly withdrawn, the tip wiped free of excess blood and lightly touched to draw the blood down to the 0.5 line. Avoid taking blood which has been exposed to air for more than a few seconds or which shows any clot formation. Mixing Blood and Diluent: Immediately after drawing blood, immerse the end of the pipette into the eosinophil diluting fluid and while rotating the pipette between the fingers, draw fluid to the graduation above the bulb. Care should be taken to prevent blood from leaking out of the pipette especially when it is first put into the diluent. Shaking the Pipette: The pipette is held between the thumb and forefinger and shaken slowly in a wide arc for approximately 10 seconds. Between each stroke, the pipette is rotated approximately 45 degrees. Care should be taken to close one or both ends of the pipette tightly with the finger to avoid leakage. Charging the Chamber: The chambers should be loaded immediately after the pipette is shaken. Hold the pipette at a 45 degree angle, discharge 3 drops of the solution to empty the capillary stem, then place the tip of the pipette on the chamber to be loaded. Allow the fluid to run out rapidly under the cover glass and fill the chamber without overflowing at the edges. The forefinger may be placed over the rear of the pipette to control the rate of flow of the fluid. Counting Eosinophils: Allow the loaded counting chamber to stand for at least 3 minutes to permit lysis, staining and settling of the cells. After the cells have settled, the slide may be moved around as desired or it may stand for several hours before counting. Evaporation may be retarded by moistening the inside of a slide box or similar container and inverting it over the slide. Cells are most recognizable and easiest to count at a magnification of 150 times with a field of vision which includes a one square millimeter area. The eosinophils have a distinct cell wall enclosing numerous large red or pink granules. The remaining white blood cells are pale, usually with a wrinkled cell wall. All the red blood cells should have completely disappeared. Each chamber consists of ten 1 square millimeter areas subdivided into 16 smaller squares (Diagram A). As seen through the microscope, the left hand side of the chamber has an identifying number. The upper row is counted from left to right beginning with this identification number and the lower row is counted from right to left ending at the identification number (Diagram B). Beginning in the upper left hand corner, the first vertical row of 4 squares is centered in the microscopical field. All the eosinophils within the 4 squares and those touching the ruled lines on the left and on the upper part of the squares are counted. The slide is then moved so that the next row of 4 squares is centered and the eosinophils counted in the same manner. The cells touching the rulings on the right and lower sides are not counted. 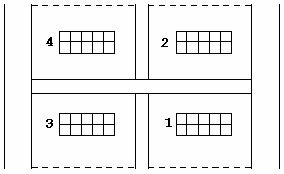 The eyes can be trained to move up one row of 4 squares and down the next (Diagram C). Speirs-Levy Eosinophil Counting Chamber is available online from the EMS Catalog. For ordering or product information, click here.